After the Patriots traded quarterback Jimmy Garoppolo, Tom Brady has a new backup: His old backup. For the last two-and-a-half years, Bill Belichick believes the New England Patriots possessed the best quarterback situation in the NFL. The best quarterback to ever play the game remains atop New England’s depth chart in Tom Brady, who’s leading the league in passing yards at the halfway point of his 18th season. But Jimmy Garoppolo, once deemed Brady’s heir apparent under center, is no longer part of the equation. The Patriots shipped Garoppolo to the San Francisco 49ers on Monday night in exchange for a 2018 second round draft pick. The potentially uncomfortable decision of choosing between the ageless Brady (who’s 40, if you haven’t heard) and the 25-year-old Garoppolo (he turns 26 tomorrow) was careening ever closer, with Garoppolo’s rookie contract expiring at season’s end. Using the franchise tag on Garoppolo was always a possibility, though never realistic in a sport with a salary cap – however easy it can be to manipulate. Of the nine quarterbacks Belichick has drafted since becoming head coach of the Patriots, the first of which was Brady with the 199th pick in 2000, none has been selected higher than Garoppolo in the second round at No. 62 overall in 2014. The justification for the selection of Garoppolo could be made by the drop – however slight – in Brady’s game, particularly in the 2013 season. Brady’s 87.3 passer rating was the fourth-lowest of his career in a full season, higher only than his marks from 2001-2003; his 60.5 completion percentage was the second-lowest of his career and his touchdown percentage of 4 percent (meaning of Brady’s 628 pass attempts, only 4 percent went for touchdowns) was the lowest excluding his rookie season of 2000 and the lost season of 2008. That, and the Patriots had just completed their ninth consecutive season without a Super Bowl title. Whether Brady were to admit it or not, having Garoppolo over his shoulder elevated his play. Two more Super Bowl titles later and Brady has cemented his status as not just one of the all-time greats, but the greatest to ever play the position. For that reason alone, it was worth Belichick investing a valuable draft pick in Garoppolo. Despite making only two career starts, Garoppolo was able to fetch a draft pick in return that should easily slot between Nos. 33 and 36 next April, given the 49ers are 0-8 and one of just two remaining winless teams in the NFL. The likelihood of the Patriots actually keeping the pick is impossible to project, but the fact remains New England will have something to show for in exchange for Garoppolo. The same can’t be said of four other draft picks Belichick has invested in quarterbacks to back up Brady through the years, including Rohan Davey (fourth round, 2002), Kliff Kingsbury (sixth round, 2003), Kevin O’Connell (third round, 2008) and Zac Robinson (seventh round, 2010). All four were released without compensation. Matt Cassel (seventh round, 2005) netted a pick that turned into safety Patrick Chung, Ryan Mallett (third round, 2011) netted a seventh-round pick that was later packaged together in another trade for multiple picks, one of which has turned into promising defensive end Deatrich Wise Jr. Jacoby Brissett (third round, 2016) brought back wide receiver Philip Dorsett in a deal at the end of this past preseason. With Brissett and Garoppolo both exiled in a matter of months, New England will turn to another former Brady backup in Brian Hoyer to once again serve as his understudy. Speculation that Hoyer was coming back to Foxboro began almost as soon as the Garoppolo deal became official, given that Hoyer was on San Francisco’s roster and had been benched during the team’s Week 6 loss to the Washington Redskins. Bigger names such as Colin Kaepernick, Robert Griffin III and Johnny Manziel remain out of work. 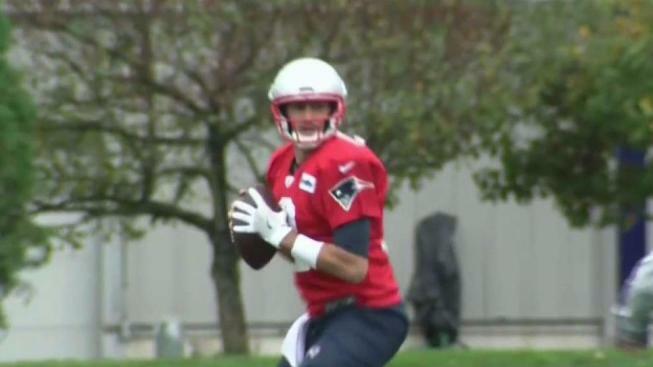 Hoyer signed a three-year deal with the Patriots through the end of the 2019 season this afternoon and was seen at the media portion of practice, donning a No. 2 jersey last worn in Foxboro by Doug Flutie in 2005. Hoyer was originally signed by the Patriots as an undrafted free agent in 2009, when he beat out the aforementioned O’Connell for the backup quarterback job behind Brady in his return from an ACL injury. He lasted three seasons in New England before he was released at the end of training camp in 2012 and has since been on a whirlwind tour of the NFL with stops in Pittsburgh, Arizona, Cleveland, Houston, Chicago and San Francisco. Hoyer went 16-21 as a starter with 47 touchdowns and 29 interceptions away from the Patriots. Hoyer, 32, won’t be lurking over Brady’s shoulder with the future in mind. His return to Foxboro only strengthens the notion that Brady will finish his career as a Patriot, perhaps even fulfilling his goal of playing until he’s 45. As it stands, Brady is signed through the end of the 2019 season; it’s no accident that’s also when Hoyer’s deal runs out. Belichick may spend a draft pick on a quarterback in 2018, but it almost certainly won’t be the pick the team just got back for Garoppolo. Rather, the pick will be used on fortifying whatever weakness may pop up on New England’s roster between now and then, extending the Brady championship window for at least two more years. Garoppolo may prove to be a championship-caliber quarterback at some point in his career, but lingering here as a backup beyond this season wasn’t helping himself nor the Patriots in their pursuit of a title. His potential remains strong as ever, but as long as Brady remains healthy, New England’s quarterback situation is still pretty darned good.